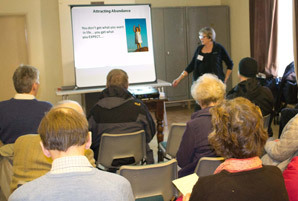 ‘Attracting Abundance’ is a great title for a talk, and we had a full house on Thursday 13th February. Everyone would like more abundance in their lives. Our speaker, Diane, is living proof that her system works. Having lost her husband some four years ago after a long illness, she mourned and moved on to create a pleasant life for herself. She was content enough, but always felt there was something missing. During a quiet meditation, she asked for three things that would bring completeness to her life: she asked for someone to love her for herself; she asked to live nearer her children and grandchildren in London; and she asked to live near the sea. And hey presto, it worked! She has met a new man (via the Internet, of course. How else does a 69-year-old meet someone eligible these days?) A widower, he lives in Brighton (handy for visiting the kids) in an apartment overlooking the sea. Having known each other for eight months, they’re just back from a holiday in Kenya where he proposed. So how does it work and whom did she ask? In a nutshell, we create our own reality with thought. It’s not what we do or say, it’s what we think. So it pays to put a positive spin on things. When you wake up in the morning, you start on a plateau. You then subconsciously choose which way to go - up or down. Instead of thinking, ‘I’m always ill’ or ‘I hate my job’, you can change that reality. Reassure yourself: ‘I am fit and healthy’; ‘I am doing my best’. We need to deliberately push away negative thoughts, says Diane. Let them go, and embrace the positive. Di reminded us that we are all energy, all vibration. And putting out good vibrations has to be better than putting out negative ones. Concentrate on feeling happiness, joy, enthusiasm. Once you start thinking like that, it continues, the good vibes go on. What ever thoughts we put out into the universe, come back to us. So be very careful what you think, and even more careful what you ask for, because you are very likely to get it. Believe you will receive it, and it will come to you. Our next meeting will be on Saturday 22nd February when Trish Mills speaks about The Perpetual Choirs.